In order to learn and grow alongside Honduran communities and schools, we will be completing a series of projects. Click each of the projects below to learn more! Help Us Build a High School! Ana Paola Hernandez Valle is 16 years old, originally from El Rodeito Honduras. She is the daughter of Santos Romelio Hernández and Enma Amelia Valle Arteaga. She has a brother named Arnol Isaac Hernandez Valle. 4 years ago when finishing 6th grade her brother Arnol, was diagnosed with brain cancer tumor. Arnol entered treatment, many people helped him, including Andrea a wonderful teacher working in upstate New York. Thanks to her support he has received his monthly treatment and is now in stable conditions. Ana’s dream is to become a nurse to help her community. El Rodeito does not have a highschool so Ana’s family needs to send her to the nearest higschool many hours away. The family supported Ana as best they could but they could only keep her in school until the ninth grade. Even with Ana working after school they can’t afford to keep her in school. The monthly cost so that Ana can study nursing is $170 / per month. Her parents do not have that money to be able to help her. Ana's dream is to be a nurse to help her parents and the community. Can you help Ana make her dream of becoming a nurse come true? Cornell student club members help raise awareness about the conditions and challenges faced in Honduras. Fundraisers support our school projects. Students teach English and S.T.E.M. in the school through our internship program. We make trips several times a year. Sign up here to receive information about our next trip! Why: Coming from an impoverished community, the students in Honduras need role models and mentors. They need to understand that there are a wide range of career paths available for them. Living in an impoverished community means that they do not have access to many things taken for granted in the US such as hot showers, clean water, electricity, internet, etc. The letters will be a way for these kids to know what is happening around the world. It will be connecting them to the world. Putting in place collaborative programs will encourage children at younger ages to explore the educational opportunities that Mayor Potencial is working to provide, and to work towards their goals. Also, the students in USA will learn to be culturally competent at an early age. 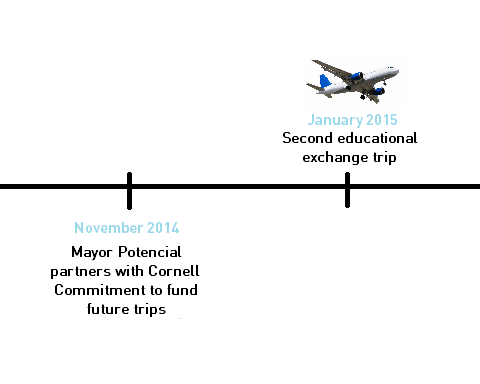 How: Monthly emails for 1 school year, Contact us at mayorpotencial@cornell.edu if you are interested in connecting your class! Why: Many of the communities in Honduras are not-self-sustainable. By helping them start and expand their businesses to global markets we are creating self-sustainable communities. The profits from the businesses can be then reinvested in the community to fund projects such a clean water. Most of the small business we are helping create are run by women. This would allow their families to have a steady source of income that is not dependent on their small farms and will empower women. The long term impact from the business development project is huge for rural communities not only as a source of income but also empowering women and giving them a voice. How: Locally made pens, wood art, and bracelets will be brought back from exchange trips and sold on this website. When: This is a long-term project that MP will begin next year. Why: Currently there is only one elementary school in El Rodeito, Honduras and as the students grow older, they hope to attend high school but the closest one is miles away. Without transportation, they would need to walk hours in order to get to and from school. Because this is not feasible, we hope to build a local school for students to attend 7th – 12th grade. Installed electricity at Ramon Rosa, the local elementary school. Donated laptops and projectors for the school. Donated backpacks and school supplies for every enrolled student. Donated school supplies for the teachers, including chalk, markers, notebooks, pens, etc. Collected data about the kids' diets to begin development of a school meal plan. MP partnered with the College of Agriculture & Life Sciences and the Dyson School to offer a Social Entrepreneurship course at Cornell. In AEM 3381-AEM 3382 “ Social Enterprise Development” Cornell Students learn about the challenges in developing countries and the importance of developing business in these areas. Developed clothing program to sell donated clothes for money and 100% of the money raised is used to provide school supplies or food to the kids. Partnered with local artisans in Honduras for production of crafts and jewelry that will be sold in the US. Brought back locally made pens, wood art, and bracelets to gauge interest.